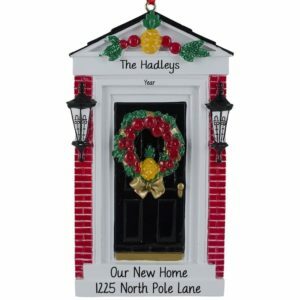 Deck the halls with our lovely personalized house & new home ornaments! Certainly one of the most memorable events in anyone’s life is the purchase of a new home or condo. This event is definitely one that should be acknowledged with a special keepsake. 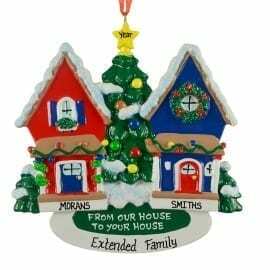 Personalized Ornaments For You understands not everyone calls a single family house a home. Choose one of our New Apartment or New Condo keepsakes that will be hand personalized by an experienced writer. Choose a bright & shiny front door ornament to celebrate the joy of owning a townhome or duplex. Find a treasure for the new owners of a beach home. 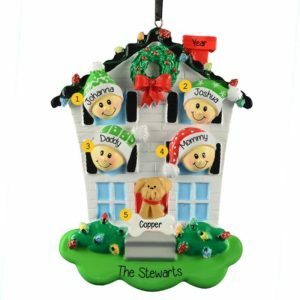 Many of our personalized home Christmas decorations include smiling faces with knit caps that can be customized with each family member’s name. Some designs can accommodate a pet too! Remember, we have sentimental gift ideas for special neighbors who are just like family too!